A fully managed Wireless network which will be robust, reliable and secure network is the main component that everything else within your organisation relies upon to run smoothly. An essential element in the foundation of your communications network should be a fully managed wireless solution. Apple provide a number of different ways in which iPads can be configured and managed, making it possible to control settings and restrict certain features and inappropriate content. There are two models available, one of which involves a physical sync with the device. Managing profiles on these devices in this way provides a way for the school to configure wireless settings, proxy settings and restrictions on content and the ability to install applications. Although these profiles can be removed by the user, the result is also in the loss of internet connectivity and other network resources. The most manageable solution involves a management server and provide all the benefits of the above method, but also enables these profiles to be managed wirelessly. With large numbers of users this method simplifies the rollout of profile updates requiring very little physical intervention. This solution also provide a number of other features including private or public email, file storage and media sharing. Interactive Whiteboards improves the way you teach, train and present information, whether to adults or children. It combines the look and feel of a regular whiteboard installation with the power of ICT so you can save and print notes, collaborate on electronic documents, share information and run multimedia materials. In the few years since touch screens and interactive displays first appeared in the market they have tumbled in price and excelled in performance. They are now a viable alternative to an interactive whiteboard and projector set up. Small screens through to the large format touch screen offer excellent performance with high speed and accuracy allowing for clear and precise presentations. The important ability is that you can draw and annotate precisely using only a finger and without the need for frustrating pens and writing tablets. LCD Projectors have become a fundamental part of the meeting and classroom. The advancement in technology has enabled it to continue to rival Plasma and LCD displays. With interactive and 3D technology now available removing the need for interactive whiteboards, a projector is a cost effective solution to the interactive meeting and classroom. Cablers offer a wide range of projectors including NEC, Epson and Casio and our trained engineers can survey and design an installation suited to you exact requirements. LCD and DLP projectors are still a popular product and the performance and picture quality can still rival the new LED and ultra short throw projector. Sometimes wall fabric makes it impossible for the heavier utlra short throws to be installed or a large quantity of upgrades might mean a budget concious decision. Most projectors come with a 3 or 5 year bulb and unit warranty for education and are most often a straight swap for existing projectors. Most LCD projectors come 3D ready with widescreen technology. Ultra short throw projectors are becoming the industry standard for new installations, they produce excellent image quality with reduced shadow and are eye safe with minimal periphery light shining into the users eyes. The projector mount directly above the board and extremely close to the wall creating a compact neat installation. This is the worlds first lamp less projector, powered by a laser LED light source. With up to 20,000 lamp hours and 5 year warranty, regular upgrades and bulb problems are a thing of the past. The new technology also means the product is only 44mm thick creating a modern stylish design for your meeting room or classroom. 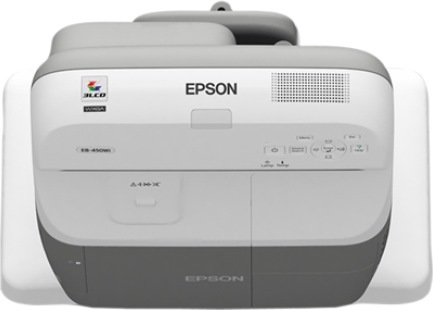 Epson EB455Wi projector (pictured left) allows you to turn any standard whiteboard or smooth wall into an interactive learning area. The BrightLink 455Wi allows educators to use their current curriculum programs as well as expand to e Text-books and more electronic content. 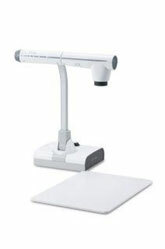 The ELMO L-12 is an all-inclusive visualizer/ document camera designed for teachers looking to incorporate 21st century classroom technology to create dynamic lessons that enhance learning, interaction, creativity and academic performance of students.